Bartolomeo Racca bought the Montanello Estate from the Count of Castiglione Falletto in 1864. For many years it was the home of the first wine growers’ cooperative of the Langhe which united 36 families. This marked the start of the production and sale of the first Barolo wine. Today, five generations later, the Racca family still owns Montanello – managed by Alberto Racca and his sisters Maria Pia and Cristina. Barbera d’Alba DOC, 2014…..Intense and generous, with crushed rose bouquet – bright ruby-red from vat of steel aging. Langhe Nebbiolo DOC, 2014…..Well-balanced structure with sweet, persistent finish from 10-month oak barrel aging. 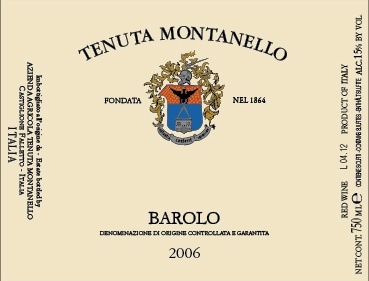 Barolo ‘Montanello’ DOCG, 2006/2010….. Classified as one of the Great Vineyards of the Langhe, the hill of Montanello has complex soils and excellent S-SW exposure.It has a penetrating bouquet and luscious mouthfeel, worthy of its long history – half the vines were planted in 1943.